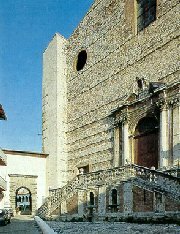 In 1304 the Dominican Pope Benedict XI donated the parish Church of Santo Stefano in Castellare, the cathedral of Perugia until it was supplanted by San Lorenzo, to the Dominican Order. Works to build the abbey and the new church started the same your with the demolishion of the old Church of Santo Stefano. This church dated back to 1163 and all that remains of it today is a double Romanesque portal in the cloister of the convent. The building is now is the seat of the Museo Archeologico Nazionale dell’Umbria and of the State Archives . The imposing Gothic hall-building of the Church of San Domenico, with three aisles, was used as a model of inspiration for the design of the later cathedral of San Lorenzo. 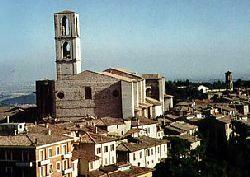 It was consecrated only in 1459 by Pius II, while the belltower was not completed until the late 15th century. Soon after its completion, the upper section was deemed unstable and had to be demolished. In 1614 and 1615 the vaults and the pillars of the nave collapsed. Rebuilding work was initially entrusted to a local architect but, when even the rebuilt structure began showing signs of collapsing, the commission was awarded to the Roman architect Carlo Maderna. By now Baroque in style, the rebuilt church was consecrated in 1632. The Baroque decoration and furniture within the church is no longer in place. Gothic influences remain in the exterior walls, the transept, the chapels of the choir and the huge apse window, which is one of the largest in Italy (21 x 8.5 metres). The most noteworthy works include the altar piece by Agostino di Duccio (1459) in the Madonna del Voto chapel; the anonymous funerary monument to Pope Benedict XI, who died in Perugia in 1304 (it was dismantled from the old church of Santo Stefano in 1700 and was not reassembled until 1959 but it remains one of the best kept 14th century Gothic wall-tombs); a Renaissance inlaid wooden choir; a gonfalon by Giannicola di Paolo dated 1494; votive frescoes from the late 14th century, including the 'Stigmatisation of St Elisabeth of Thuringia' (who although she was a Sister of St Claire has the honour of being depicted in a Dominican church because she was sanctified in Santo Stefano in Castellare, which preceded the actual church); some fragmentary and badly damaged frescoes from the early 15th century that are of good quality however and attributed to Benedetto di Bindo.